We’d love your help. Let us know what’s wrong with this preview of The Quality School by William Glasser. "This should be required reading by every school administator, every teacher, every board member and all university faculty involved in the training of teachers. There is no doubt that we need to squeeze all blame, all coerion and all criticism out of any people-related business. Not until we realize that schools are in a people business will we ever be able to make meanin "This should be required reading by every school administator, every teacher, every board member and all university faculty involved in the training of teachers. There is no doubt that we need to squeeze all blame, all coerion and all criticism out of any people-related business. Not until we realize that schools are in a people business will we ever be able to make meaningful changes." To ask other readers questions about The Quality School, please sign up. مدارس کیفی در فراهم ساختن محیط آموزشی شاد و پویا که در آن معلمان و دانشآموزان با هم رابطة رضایتمندی دارند و هر دو از انجام کار کیفی لذت میبرند و احساس ارزشمندی میکنند، برای گلسر توفیقی آموزشی و تربیتی محسوب میشود. گلسر این کتاب را برای فراهم ساختن چارچوب نظری برای معلمان و برنامهریزان مدارس نوشته است. وی هدف از نوشتن این کتاب ارائة یک چارچوب راهنما برای چگونگی مدیریت دانشآموزان است تا با آنها بهگونهای رفتار شود که بیشترشان بتوانند و بخواهند در کلاس کاری کیفی انجام دهند. باید بپذیریم که غیر از «کا مدارس کیفی در فراهم ساختن محیط آموزشی شاد و پویا که در آن معلمان و دانش‌آموزان با هم رابطة رضایتمندی دارند و هر دو از انجام کار کیفی لذت می‌برند و احساس ارزشمندی می‌کنند، برای گلسر توفیقی آموزشی و تربیتی محسوب می‌شود. گلسر این کتاب را برای فراهم ساختن چارچوب نظری برای معلمان و برنامه‌ریزان مدارس نوشته است. وی هدف از نوشتن این کتاب ارائة یک چارچوب راهنما برای چگونگی مدیریت دانش‌آموزان است تا با آن‌ها به‌گونه‌ای رفتار شود که بیشترشان بتوانند و بخواهند در کلاس کاری کیفی انجام دهند. باید بپذیریم که غیر از «کار کیفی» هیچ چیز دیگری نمی‌تواند به مشکلات ما در مدارس پایان دهد. گلسر بر این باور است که: «نوجوانانی که در مدارس کیفی تحصیل می‌کنند، درگیر رفتارهای خودتخریبگر نخواهند شد و سرمایة جامعة خود محسوب می‌شوند. This is the book that introduced me to the pioneering work of management expert W. Edwards Deming at the beginning of my career and sparked my interest in Quality Theory. Glasser applies to the classroom the philosophical approach that Deming used so successfully to help the Japanese rebuild their industrial base following World War II. Specifically, Glasser describes how educators can manage students in a non-coercive way that will empower children to produce quality work, improve continuously This is the book that introduced me to the pioneering work of management expert W. Edwards Deming at the beginning of my career and sparked my interest in Quality Theory. Glasser applies to the classroom the philosophical approach that Deming used so successfully to help the Japanese rebuild their industrial base following World War II. Specifically, Glasser describes how educators can manage students in a non-coercive way that will empower children to produce quality work, improve continuously, experience joy, and take pride in their learning. With the modern push toward standardization in education, fueled further by the No Child Left Behind legislation, it seems fitting –if not terribly desirable– that students be compared with workers and school with a factory. Dr. William Glasser, however, turns that analogy against those who would unwisely use it. In his thought-provoking volume on choice theory, The Quality School, Glasser uses as a point of departure the success obtained by Dr. W. Edwards Deming as he endeavored to transform p With the modern push toward standardization in education, fueled further by the No Child Left Behind legislation, it seems fitting –if not terribly desirable– that students be compared with workers and school with a factory. Dr. William Glasser, however, turns that analogy against those who would unwisely use it. In his thought-provoking volume on choice theory, The Quality School, Glasser uses as a point of departure the success obtained by Dr. W. Edwards Deming as he endeavored to transform post-bellum Japan into the economic giant it became in the eighties and nineties. Deming’s vision was singular: cease to coerce workers; instead, give them a reason to want to produce quality products. Glasser suggests that most of the problems plaguing modern schools stem from coercive methods of management, both at the classroom and at the supervisory level. A move away from this defunct model toward a Demingesque “quality school” is, on Glasser’s view, the only answer. Glasser spends considerable space in the book expounding on choice theory, the keystone of a quality school. This view of human motivation argues that all human beings have five basic needs innately programmed into them: survival, love, power, fun and freedom. While this list assuredly echoes theories concerning affective needs, Glasser differs from other theorists by insisting that only these needs control our behavior. No external force can move us to do something we do not choose to do. We are experiencing as a result, he contends, the failure of traditional “boss-management” leadership styles (in which the boss sets standards without compromise, tells workers how to perform tasks without showing them or accepting feedback, inspects work without input from workers –leading to their producing only minimally acceptable product– and uses the threat of punitive measures to keep workers in line). *Showing that the manager has done all she possibly could as a facilitator to put the best tools, workspace and non-coercive ambience at the workers’ disposition. Beyond the obvious applications of lead-management to principalships and superintendencies, Glasser goes on to argue that the classroom itself should be modeled on the lead-management-controlled workplace. 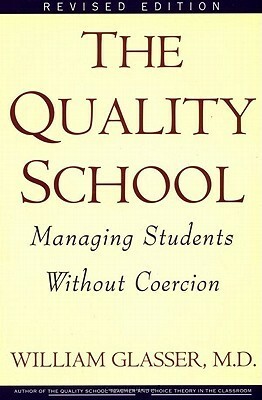 Recognizing that teaching is the most demanding and least rewarded profession, the author highlights an important difference between teaching and other sorts of authority positions: whereas, for example, workers in a factory have chosen to seek employ at that place and understand the benefit they derive from working well within the system established by the managers (or like patients in a doctor’s office trust that the physician is endeavoring to make their health better), students are not in school, typically, of their own volition, nor are they totally convinced of either the benefit of education or the goodwill of the teachers. These considerations, along with the lack of cultural support for education and the emphasis on low-quality standardized test scores, make teaching insanely complicated when professionals utilize traditional boss-management techniques. Faced with the understanding that students’ five basic needs must be met in order for them to produce quality work –what Glasser argues school should really be all about, in contrast with the present prevalence of excessive quantities of low-quality multiple choice assignments –schools simply need to restructure themselves. Rather than hurtle students along a conveyor belt of empty memorization and skills tests, students need create quality work… regardless of how long it takes them. Once they begin to see quality work on display throughout the school, once their teachers are modeling such quality work themselves, once they see that quality in their own product, students, Glasser affirms, will begin to include school in that utopian inner fantasy world, their “quality world,” in which all the pleasing things they take joy in doing can be found. *No more Cs, Ds or Fs: students work on an assignment until it is of the sort of quality they are capable of. This may mean extending some one-year courses (algebra, for example) to two years. To compensate for the severe asymmetry of the grade curve, students who go above and beyond, completing volunteer assignments and the like, will be assigned A+s. *Students have input on the sorts of assignments they will be completing and the time they need to do so. *Students have to constantly self-evaluate, checking work for quality and determining paths toward superior product. *Classrooms are permanently reordered so that the teacher ceases to be the focus, most commonly by creating permanent cooperative groups. *Punitive rules are eliminated. Conflicts are dealt with as the inability of a student to have one of her needs met, and dialectical approaches (with a time-out room on campus for severe cases) are used to reach resolution. Parents are not contacted for such matters, as the student must work through these difficulties herself, and the threat of “I’m calling your mom/dad” creates the sort of adversarial relationship between student and teacher that the quality school tries to remove. *Homework is drastically reduced or eliminated (except where a student is finishing classwork at home). Quality work is produced through a union of workers and a lead-manager, and to be assigned tasks to be completed outside of the quality school runs contrary to its purpose. *Persuade students to accept existing curricula by selecting key products (projects, papers, experiments, etc.) and asking students if they’re willing to do these specific components well. Once they have, the subsets of skills required can be explained to them, and they will be more willing to work on the nuts and bolts required for larger quality assignments. *Include volunteer “friends” (i.e., mentors) who will deal one on one with those students whose need for belonging is not being met; Glasser theorizes that quite a bit of acting out comes from a type of loneliness only treatable by friendship with an adult. *Institute a student peer counseling program. Still very timely to this day. I wish more schools would use the Quality Schools philosophy. The Quality School owes its whole premise to Zen and the Art of Motorcycle Maintenance, but unfortunately its author, Dr. William Glasser, is neither the philosopher nor the rhetorician that Robert Pirsig is. The Quality School suffers from bland writing and poorly explicated ideas, although the concepts themselves are for the most part worthwhile. Dr. Glasser makes no attempt to define quality (even to say, as Pirsig did initially, that Quality by its nature cannot be defined) until the end of The Quality School owes its whole premise to Zen and the Art of Motorcycle Maintenance, but unfortunately its author, Dr. William Glasser, is neither the philosopher nor the rhetorician that Robert Pirsig is. The Quality School suffers from bland writing and poorly explicated ideas, although the concepts themselves are for the most part worthwhile. Dr. Glasser makes no attempt to define quality (even to say, as Pirsig did initially, that Quality by its nature cannot be defined) until the end of chapter seven, roughly two-thirds of the way through the book; and even then he uses the word "quality" in his definition! I found the overuse of that term, undefined, immensely distracting, especially since he makes contradictory claims about quality, saying in one place that students can inherently recognize quality in schoolwork and in another place that students will not recognize quality unless it is pointed out to them. His argument is that American schools are typically run by teachers and administrators who govern by coersion and punishments, rather than respecting that students will do work freely if they can see quality in the tasks they are asked to do. I agreed with many of his ideas, although the presentation (laden with business jargon) made me wince. It was doubly off-putting to realize that Dr. Glasser runs an organization that consults with schools to help them become Quality Schools (capital Q, capital S), and toward the end of the book he makes the claim that teachers and administrators cannot really understand how to become a Quality School without proper training (which is of course acquired by contracting with his organization). He also spends too much time hyping other books he has written, and often rather than explain a term or theory he refers the reader to one of his other books. This could have been either a much shorter or a much longer book. As it stands, Glasser gives lots of business theory, creates caricatures of the unenlightened teachers who don't sign up for his training, and offers few useful examples where his theory has been put into practice. He confidently, and laughably, predicts that schools will not need any discipline strategies once all coercion is removed. He also displays a ham-fisted and occasionally creepy approach to friendliness: universal name t This could have been either a much shorter or a much longer book. As it stands, Glasser gives lots of business theory, creates caricatures of the unenlightened teachers who don't sign up for his training, and offers few useful examples where his theory has been put into practice. He confidently, and laughably, predicts that schools will not need any discipline strategies once all coercion is removed. He also displays a ham-fisted and occasionally creepy approach to friendliness: universal name tags and uniformed "quality teams" that chase students down to their homes? ايده كتاب جالب و قابل تأمل بود اما خيلي با نثر و شيوه بيان اون نتونستم ارتباط برقرار كنم . بنظر مي رسه انگار متن كتاب از يك سلسله سخنراني استخراج شده و انسجام لازم رو نداره و در بخش هاي ابتدايي تكرار مطالب زياده. اما در كل به همه كساني كه به موضوعات آموزشي تربيتي و نظريه انتخاب گلاسر علاقه مند هستند اين كتاب رو پيشنهاد مي كنم. Dr. Glasser provides an uplifting solution to the problems of many schools. Teachers and parents can feel good about his suggestions since his optimism and belief that every child can succeed is contagious. To be fair, much has happened in the educational world since standards and high stakes testing came to rule the landscape, but many of Glasser's basic ideas are helpful nonetheless. I really enjoyed a great deal of this book. Especially where it dealt with attempting to bring education into students' quality world by changing your classroom into one in which coercion is never used. Loved this book! Not just a book for teachers and administrators, but for anyone wanting to draw the best out of their teams. Parents should read this as well -- should be required reading for anyone who works with children. William Glasser believes in creating relevant assignments for students that help kids to see the connections between school and their world. Interesting ideas. A little dated. Tips and pointers on how to create a better school. The book was okay but really dry and hard to read in certain spots. I would not recommend this to many, especially outside the educational system. Theories in this book could also be applied to business management. Bravo. I did not read this for the school environment, but for the 'non-coercive' approach to managing. An excellent book, not really dated. Glasser's theories are interesting, but can only go so far in classroom implementation.